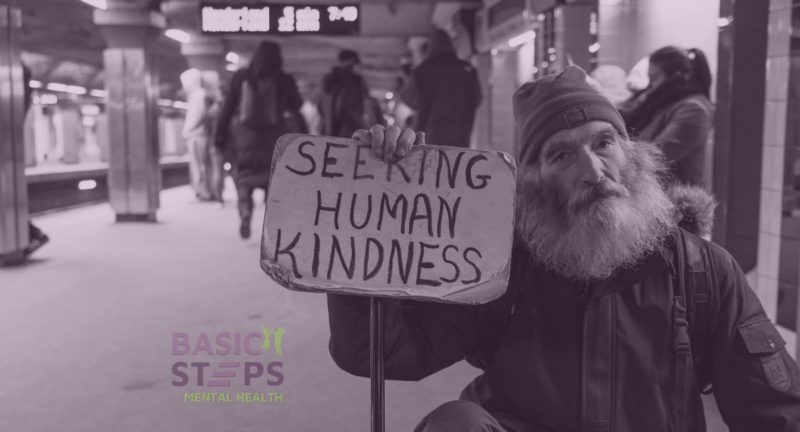 As the clinical director of Basic Steps Mental Health, I have the honor of meeting with an incredible staff daily and talk about the clients we treat. We are a bunch of people who have gone through treatment in the past, dealt with our mental illness and tend to see things from the client’s perspective. This type of staff has some great advantages because we have been there, have gotten through it, and try to help others do the same. In our meetings, we go over what works and what doesn’t work and talk openly about how we can improve as a company. Although we teach a minimum of ten Psychological Approaches what we believe helps people the most is simply compassion. After 25 years in this field, it is apparent that interventions don’t always work. People are unique and finding out what works for one person but doesn’t work for another is a major daily endeavor that makes therapy a fascinating endeavor. The common denominator is – people just want to feel good. Our staff is in charge of providing that feel good. Through our comments, our actions, and the little extras we do to show how clients are important to us. It is not uncommon for us to call clients after hours if we think about them, to let them know they are human beings that matter. Does this mean that our staff is always up, happy, and loving? No, it is not. It is natural to have off days, miss an intervention and upon writing a progress note discover the perfect intervention you forgot. This is why compassion is so important. We may miss the intervention, but compassion is what really heals. Since compassion is the most important aspect of treatment, there cannot be a detriment in treatment if a therapist uses it. Sometimes, however, compassion may seem a bit far-fetched when somebody is disrupting the group, are making a personal attack on you, or even when the therapist finds no redeeming qualities in the client at all. This is why personal therapy is so important for new therapists entering the field. Often, clients that display our own problems can trigger us and it makes for bad medicine. Once a person works through a problem, it is more bearable when it is discovered in another. We are aware of the fact that clients try to pull us into their family of origin dynamics and want to bond with us that way. This was how they learned to bond and for the therapist that hasn’t had experience with this, it can cause them problems. Finding good supervision is a plus, especially in the early stages of developing this craft. Seeing the dynamics that others bring into treatment is key. This can create a lot of compassion on our part in simply realizing that they have had a very difficult life and have chosen us to help them through it. When a therapist can hold onto their compassionate heart, they demonstrate that their love is strong enough to withstand what the client is bringing to treatment and that they are in a safe environment. We are actually showing them how a real family can act. As our company moves into its third year, we like to think of ourselves as Disneyland. Often Disneyland is under construction and creating new fabulous rides. Still, the old favorites are still around, but the new techniques keep the park alive and fresh. We as a staff are devoted to assessing our approach, adjusting it, and learning from both successes and failures. We are an alternative to the 12 Steps and to other non-12 Step approaches in addressing problems four ways: physically, mentally, emotionally, and spiritually. All and all we like to think of our compassionate work as trend-setting – which is a shame. We shouldn’t be the exception but the rule. It is important to remember that clients are customers and we are providing them with the services they are paying for. Treating people with dignity and realizing that they are injured and looking to us as healers give us in the helping profession a lot of responsibility. If this person cannot help themselves then who better then us? Do we want to send them down the pike and make another person responsible, or can we do our 100 percent and provide them with compassionate care they desperately need? When I started in the field, compassion was hard to come by. I discovered that only a handful of therapists really cared. Overall, there was a lot of shaming tactics used by people who, if a client didn’t follow the dictates of staff, were blamed for being wrong. “They didn’t reach their bottom yet”. Another rationalization was, “They didn’t adhere to the program properly.” In doing so, the program avoided adjusting their approach and learning from mistakes. At another placement, staff had glee in demeaning a client and telling them they were worthless and would end up in jail or as a whore. To enjoy oneself at the expense of another person was heartless but since the supervision lacked at the facility, that type of treatment flourished. In another placement, if somebody didn’t follow the handouts provided or the arbitrary rules, they were labeled a distraction and discharged. Where is the compassion in that? This article was written as a reminder to treat oneself and others with kindness. The slogan we follow at Basic Steps Mental Health is: “When love is applied to hurt we heal”. Love is seen as the ultimate healer. Can we shame our way into healing? The Light can’t be found through the dark. When this industry realizes that the key to healing is through compassion, love, and especially through forgiveness of self. Yes, we might have done some terrible things in the past, but as we learn and grow, and adjust our behaviors, those acts from the past don’t define us for who we are now. Otherwise, this staff would be Borderlines, junkies, alcoholics, addicts, majorly depressed, Bipolar… Well, you get the picture. For more information, call us at (425) 588-8438 to schedule a free one-hour consultation. Basic Steps Mental Health provides an in-depth Outpatient Program that is residential like in its scope. We treat the root causes of addiction and mood disorders with compassion and care. Participants are taught numerous Psychological approaches to get to the root of the problem. Participants ultimately learn how to counsel themselves on paper!